The volunteers at the Oyster Bay Railroad Museum continue to toil away on our various projects each Saturday, making progress by leaps and bounds. This summer has been especially productive, having completed the bulk of our planned projects requiring semi-skilled labor. This progress however, has now left us with a unique problem. All of our weekly volunteers are very dedicated and are willing to step up to any task asked of them. Unfortunatly we have reached a point where much of the work needing to be done requires special skills or advanced knowledge. Specifically, we are in desperate need of volunteers who can assist us with such tasks as welding and metal fabrication, diesel mechanics and concrete/masonary work. We have much of the tools and equipment to do this work, and certainly we have no problem with obtaining materials that may be required, but we desperately need the skilled labor to get the jobs done. We have a couple of people who have been a great help to us, but the amount of work to be done coupled with other responsibilities these volunteers have far out weighs their availability. Please note that we are also soliciting bidders for some of this work to be done on the Ping Pong Coach in conjunction with a grant award. Specifically we are seeking professional contractors for welding / metal fabrication as well as professional paint removal / application. Bidders for this specific project must be licensed and insured contractors in order to be considered. Obviously all work will have to be done at our site. If you or someone you know is able to assist us with some of the aforementioned tasks, or is interested in bidding on the Ping Pong Coach work, please contact Steve Torborg at your earliest convenience. Thank you in advance and we look forward to hearing from you! Jimmy Buffett had it right...I'd rather die while I'm living than live when I'm dead! Thanks to the tremendous assistance which we recieved this past Saturday from Conrad MIlster, well renown steam engine expert, our "civil war era" single cylinder steam engine is now up and running for demonstrative purposes. After completeing a very long list of minor tweaks and small repairs we plan on having it running during our Saturday hours. It will work on compressed air and we are now looking at a small portable boiler to give us steam. We also plan on moving the entire unit closer to the entrance while we begn moving pieces to complete our site plan and will build a structure around it. We were fortunate that when the unit was donated by Old Bethpage Village Restoration, we also received a bonus unit that will be fitted with a large grinding stone that is powered by the flywheel via a leather belt. Today marked the official release of former LIRR engineer Mark Smith's book, entitled "My Life on the LIRR: Memories of a Steam Locomotive Engineer" The book contains a pretty interesting selection of stories from Mark's 30+ year tenure on the Railroad, ranging from his day to day LIRR duties to his WWII service on locomotives in Italy. It is available on Amazon, as well as through both RMLI and LIST. The proceeds from the book sales will be used to support the restoration efforts for LIRR #39. I've read my copy a couple of times already, would definitely recommend it to anyone who has any interest in the history of the Railroad, particularly in the 40s-70s timeframe. Very easy read, great for all ages, and you get to help the #39 project at the same time. On Wednesday, July 23, we loaded Defiance Coal Company, H.K. Porter No. 1 narrow gauge steam locomotive onto a road trailer for transport to the Strasburg Railroad Company, Strasburg PA. The "Roy Dunwell" is off to have his boiler tubes and dry pipe replaced along with some minor maintenance to be performed. When he returns to his newly painted trailer at the RMLI he will be ready for NYS Labor Department inspection and certification to operate. The RMLI plans to use No. 1 for education classes in steam operation and as an operating Museum Outreach at Festivals on the East End of Long Island. Just as our benefactor, Mr. John Deegan of Southampton, NY used to do, the "Roy Dunwell" may represent the RMLI in local parades. H. K. Porter No. 1 of the Railroad Museum of Long Island rests comfortably in the Strasburg Railroad Company Shops, Thursday morning, July 24, 2014. The two major issues to be repaired on No. 1 is a cracked "dry pipe" that sends steam to the injectors and new steam dome studs and a copper "O" for the lid . . . . calculations will be performed on the old steam dome lid and as necessary, a new one may be made. Since No. 1 has not been fired in over ten years the RMLI believes it is prudent to replace the boiler tubes before firing the engine. Strasburg will do that work for us. Other minor maintenance issues include new compliance plumbing about the sight glass, new wash out plugs, and attention to an old support area below the boiler. The green boiler will be in "stove black" when it comes home, matching the new black paint RMLI applied over the past two years of preliminary restoration/ maintenance work at Riverhead. While No. 1 is at Strasburg, its road trailer will be painted Tuscan Red and lettered for the Railroad Museum of Long Island. The trailer has already received eight new tires, new brakes and new brake drums. Trailer lighting and new air lines will also be installed. As of July 28, 2014, the Engine 39 Restoration Fund is at $119,055.07 and continues to grow. The elements and apparent neglect are taking their toll. Even if the current owner donated the car to a railroad historical society or museum, there would be considerable expense in moving the car in freight service, due to the lack of NFL roller bearings, a current air brake COT&S, and potential FRA safety defects. It won't be long before it could be time to call the scrapper. This past Sunday December 14th, 2014, albeit later than we hoped, Silk Road Transport arrived at our yard facility to begin the shipping of major parts of former LIRR Steam Locomotiver #35 to Steam Operations Corporation (SOC) facilities in Mussel Shoals Alabama. When the trucker arrived around 2:30, our volunteers had already begun to bring the first set of drive wheels out for loading. All 3 sets of drive wheels, pilot truck and 2 wheelsets along with all of the major drive/connecting rods were loaded up and at 5:30 we stopped for a group photo and sent the trucker along to Alabama. Scott LIndsey of SOC sent our volunteer leader Steve Torborg a text the following Tuesday morning informimg us that the load arrived safely and was being off-loaded as he sent the text. We are looking at another load leaving Long Island arounf February. When all is said and done the only pieces that will remain at our yard will be the original tender tank, which will be replaced with a new welded unit and the original boiler which will be the last part shipped out. We will be building a brand new cab for the locomotive and have already begun to re build the original cab for use as an interactive display for the visitors. For photos, please visit our Oyster Bay Railroad Museum Facebook page. Many thanks to our volunteers who braved the cold and a 7 hour delay sitting around the "camp fire"
as of this past Friday, February,6th 2015, the Drive wheel set #2 has had the tires removed and the wheels pressed off the axle in preparation to replace the axle and tires. If you go the Museums Facebook page you can view some of the photos that were sent to us by Steam Operations Corp of Mobile Alabama. Leave a comment if you'd like. New Facebook page for LIRR #35 for anyone who's interested, updates will be posted regularly. I recently discovered that the former LIRR 2075 SAGTIKOS, a New Haven lightweight 6-6-4 sleeper used in parlor car service between 1969 and 1975, still exists. It is currently owned by Midwest Railway Preservation Society, identified as CTVX (Cleveland Terminal & Valley Railway, Inc.) 461, and currently stored in Cleveland OH. It certainly looks a lot worse for wear today, compared to how it looked 40 years ago when it was retired by LIRR and went off "to join the circus" with Ringling Brothers. Thanks to "trainspot" for finding the recent (2014) photo of the car in Ohio! One of the 2015 capital improvement projects supported by the bequest of Mr. Walter H. Milne of DesMoines, IA has been completed. 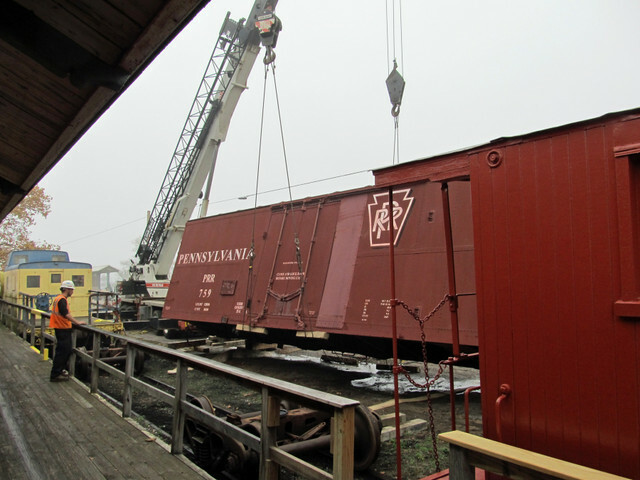 For twelve years the RMLI planned for the acquisition of an appropriate 40’ boxcar to locate at our Greenport site. Until Mr. Milne’s bequest we had not had the money to either purchase or transport a suitable car to Greenport! 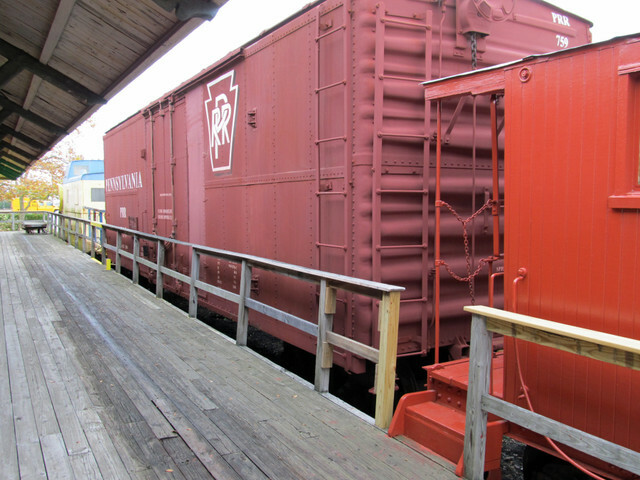 In early 2015, one of our valued members, Cameron Wolk, launched a Country-wide search for a boxcar. With funds in hand the Museum was ready to act. Cameron found available boxcars as far west as Washington State and California, as far south as Georgia and north to Vermont. 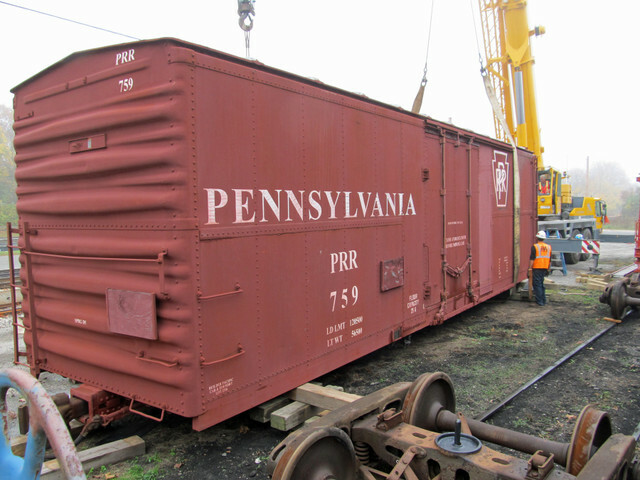 In April the RMLI contracted with the Wellsboro & Corning Railroad, a Genesee and Wyoming property, to purchase the American Colloid #759, (in Pennsy livery for photo freight work), and engaged Winters Rigging of North Collins, NY to pick and transport the car from Wellsboro, PA to Greenport, L.I. 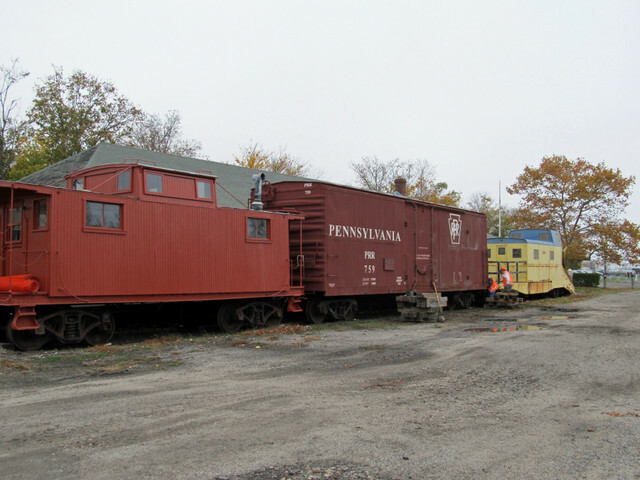 Following seven months of “permit process” with the Long Island Rail Road and the MTA, the car is now permanently installed at the Railroad Museum of Long Island. 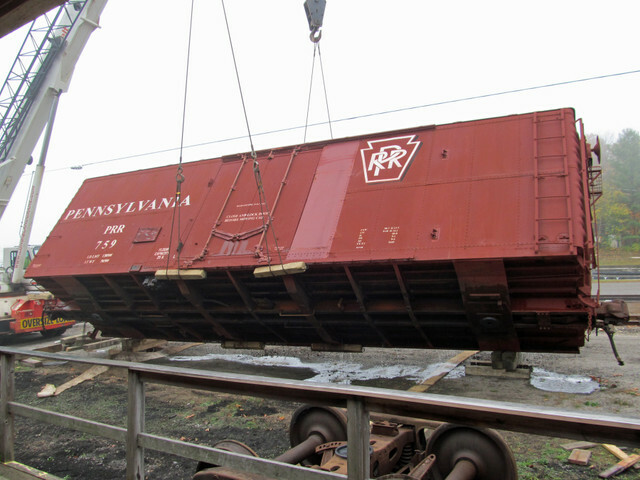 Saved from the scrap pile, this boxcar will initially be used for storage of exhibit and construction materials. Following carbody work on snowplow W-83, “JAWS,” and restoration work on the freight house, the car will be partitioned and used for a video theatre and much needed storage space at the Museum. Following are photos of the “pick and place” of the car at Greenport on Friday, November 6, 2015. Tilting a little bit more! A little bit more . . . . . we’re almost there! Upright and ready for her trucks! 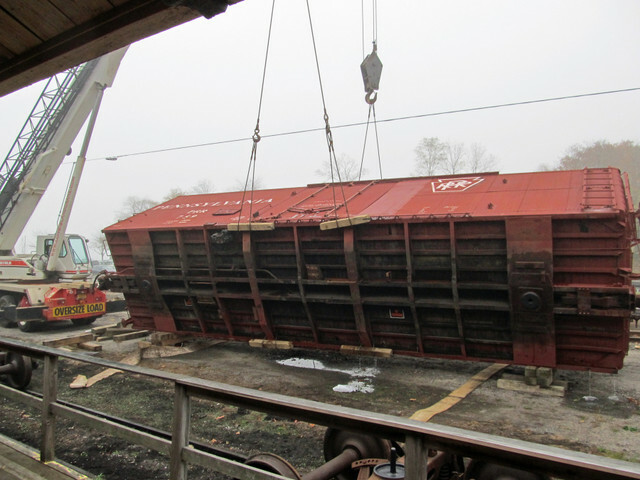 Our thanks go to Angela Johnson of the Wellsboro & Corning Railroad, T.J. Winters of Winters Rigging, and Brad Allan of Long Island Crane & Rigging for making this acquisition possible and trouble free. A “tip O’ the hat” goes to the many employees of the LIRR and the MTA who worked diligently to pave the way for this most useful addition to our collection. It's been quite some time since we updated for the Oyster Bay RR Museum. Here goes! This week has seen movement at the Historic Oyster Bay Train Station. Safety fencing has been erected around the building and scaffolding has been put up to allow the workers to begin removing the lower few feet of the old wood roof deck. Back in the 40's, the south side of the roof was cut back and we are now having the roofline remade with new rafter tails and decking/roofing. Inside, the floor has been cut to allow new footings to be poured which will be the foundations for the 4 new posts that will be installed to hold up the 2 massive chestnut roof trusses. We uncovered pieces of the old steam radiator piping underneath a ton of sand while these holes were opened up. I'm sure that is just the beginning of a lot of surprises that we will encounter. Since I have problems posting my photos, please go to the Oyster Bay RR Museum's facebook page if you are interested in see the photos. The former LIRR 2067 MECOX, which operated in parlor car service from 1969 thru 1976, appears to be in distressed condition stored at the Danbury Railway Museum. An October 2016 photograph of the car (courtesy of "Trainspot") shows three smashed windows on one side of the car; one of the square pieces of stainless steel trim that bore the New Haven script logo (later the MTA LIRR logo) is missing. I don't know if these problems are the result of recent vandalism, or evidence of a longer term decline in the car's condition. The privately owned car, restored to its original identity as New Haven 525 STRATFORD POINT, has been stored at the museum since 1998. In the past 25 plus years, I have seen more than a few private car restoration/refurbishment projects fall short of the original goals, due to lack of resources, time, commitment, technical skills, etc. The projects that have failed or fallen short of their objectives serve to increase your appreciation for the projects that have been successful. Hi Folks and Greetings from Oyster Bay! the West wall has been opened up to reinstall the bricked up doorway and 2 windows. The South West wall has had one of the windows moved back to its original spot and a new doorway installed. The South East wall was had its new doorway installed. These doorways match the originals which were removed back in 1965 when the MTA took over the LIRR and the Oyster Bay Train Station was hacked up to put in an area for the LIRR Personnel. We received all of the leaded glass transoms and side lights and for our little get together this past Saturday, we had our contractors reinstall all of them on the West wall. Damn they look good! We should be receiving all of the new doors (5) and will get 3 of them installed immediately as well as the new window sashes for the West wall window frames which will also be installed immediately. Teddy Roosevelt would be proud of our accomplishments restoring HIS train station. You can see the progress on our OBRM Facebook page or better yet, go to our official museum website to see our progress from October to December. Even better, if you are reading this, why not make an end of year DONATION. It's tax deductible and as you can see, is going to a great cause. Just click on the Paypal tab and donate immediately or send us a check. No sum is too small to see this crown jewel saved and restored.